An artist concept illustrating the TMT Observatory at the proposed site on Mauna Kea. Following the approval of a sublease on July 25 by the Hawaii Board of Land and Natural Resources, the Thirty Meter Telescope (TMT) announces the beginning of the construction phase on Hawaii Island and around the world throughout the TMT international partnership. 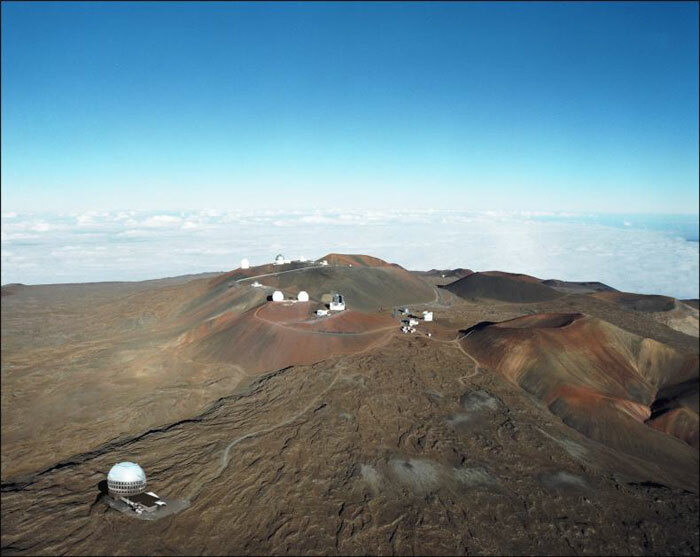 Contingent on that decision, the TMT International Observatory (TIO) Board of Directors, the project's new governing body, recently approved the initial phase of construction, with activities near the summit of Mauna Kea scheduled to start later this year. Kahu Ku Mauna and the Mauna Kea Management Board reviewed, and the University of Hawaii Board of Regents recently approved, the proposed TMT sublease. The final approval from the Board of Land and Natural Resources—the last step in the sublease process—allows TMT to begin on-site construction on Mauna Kea, home to many of the world's premier observatories. The TMT project was initiated a decade ago by the Association of Canadian Universities for Research in Astronomy (ACURA), the California Institute of Technology (Caltech), and the University of California as the TMT Observatory Corporation. Now, as the TMT International Observatory (TIO)—founded as a nonprofit limited liability company on May 6, 2014 —the project has the official green light to begin constructing a powerful next-generation telescope. The TIO founding members are Caltech, the National Astronomical Observatories of the Chinese Academy of Sciences, the National Institutes of Natural Sciences in Japan, and the University of California. India, an associate, is expected to become a full member later this year. Canada is also an associate and aiming to join as a full member in 2015. Initial construction activities in Hawaii will include grading the site in preparation for future building work, enabling a site dedication ceremony in October. TMT is committed to work within a plan for responsible development on Mauna Kea created by the Office of Mauna Kea Management. Other work has already been proceeding off-site and will continue now apace. “Design of the fully articulated main science steering mirror system in the telescope, as well as development of the lasers, laser guide star systems and other high-tech components, is proceeding in China,” said Yan Jun, Director General of the National Astronomical Observatories of China. “Japan has seen to the production of over 60 mirror blanks made out of special zero-expansion glass that does not alter its shape with temperature changes. The blanks will be highly polished for use in the telescope's 30-meter diameter primary mirror. The final design of the telescope structure itself is nearing completion,” said Masanori Iye, TMT International Observatory Board Vice Chair and TMT Japan Representative for the National Astronomical Observatory of Japan. “Prototyping of TMT's primary mirror assemblies and the building of mirror actuators, edge sensors, and support systems is ongoing in India,” noted Eswar Reddy, Program Director of the India TMT Coordination Centre. Three “first-light” instruments are also under development with major contributions from all of the TMT partners. The announcement of an imminent start to on-site work, where all of these initial developments will come together, is welcome news to scientists worldwide. The advancement of TMT to this stage of imminent on-site construction has been made possible by the support of the Gordon and Betty Moore Foundation. The foundation has spent $141 million to date to fund the design, development, and construction phases of TMT. The start of TMT on-site construction will directly benefit the local Hawaiian community. TMT will now make its first annual contribution to The Hawaii Island New Knowledge (THINK) Fund, a program that promotes science, technology, engineering, and math education across grades K-12, secondary, and post-secondary education. Over the life of the TMT lease on Mauna Kea, TMT will give $1 million per year to the THINK Fund. In the construction sector, TMT will create about 300 full-time construction jobs. TMT has committed to the hiring of union workers for these positions. Looking further ahead, during operations, TMT will have a staff of about 120-140, which will be drawn as much as possible from Hawaii Island's available labor pool. A workforce pipeline program in the meantime will also educate and train island residents for jobs with TMT, as well as other observatories and high-tech industries. HONOLULU -- Plans to build the world's largest telescope atop the summit of Hawaii's Mauna Kea were delayed Tuesday when a groundbreaking ceremony was thwarted by protestors. For native Hawaiians, Mauna Kea and the surrounding peaks are sacred. Several dozens protestors blocked the only road to the summit of Mauna Kea, or "sacred mountain." Vans carrying attendees to the groundbreaking ceremony were not able to pass. Protests were echoed across the Atlantic in Palo Alto, as well as nearby, in and among the dorms of University of Hawaii students. Hawaiian activists have been fighting the Thirty Meter Telescope for the last four years in court, but have so far been unsuccessful in stalling plans in any meaningful way. Opponents of the $1.4 billion multinational project say the construction will desecrate a place many native Hawaiians use for burials, the interment of umbilical cords (called "piko"), as well as traditional celestial observation ceremonies. "As much as I'm standing for the mauna (mountain) and all the people, today is personal for me," Kaui Peralto, a Hawaiian cultural educator at Standford University, told the San Francisco Chronicle. "We take our piko to sacred places, so I'm standing for all my family and friends who have piko on that mountain. And when the groundbreaking starts, we don't know how many will be dug up, because we bury them in secret." As Peralto organized protestors in California, her former mentor and teacher, Pua Case, led the protest on Hawaii's Big Island. Case's fight -- including Tuesday's protest -- has been assisted by a number of Hawaiian cultural practitioners and educators, including Kamahana Kealoha. "The TMT is an atrocity the size of Aloha Stadium," Kealoha said in a statement. "It's 19 stories tall, which is like building a sky-scraper on top of the mountain, a place that is being violated in many ways culturally, environmentally and spiritually." Students at the University of Hawaii also voiced their concerns over the impending construction. "This has been an issue for us because the momentum of their decision has been in full force, but they haven't made the information public for a dialogue," Pulama Long, a Hawaiian Studies major, told the university's student paper Kaleo. "It's a huge decision that affects a lot of people made by a small group." Sometime in 2023, a 30-metre man-made "eye" will open atop the Hawaiian volcanic dome of Mauna Kea in search of life beyond the solar system. And India would have contributed its "iris". Barely a month after signing in as a full partner in the $1.4 billion Thirty-Metre Telescope (TMT) project jointly developed by five nations, India is all set to make sensors and actuators that will keep the huge mirror of the biggest telescope in place. "We have completed the tests. We are ready," said Indian Institute of Astrophysics (IIA) scientist B Eswar Reddy. IIA, Aryabhatta Institute of Observational Sciences (ARIES), Nainital and Inter-University Centre for Astronomy and Astrophysics (IUCAA) constitute the Indian arm of the consortium that also comprises labs from Canada, the US, China and Japan. Edge sensors and actuators are crucial components of the telescope as the huge mirror is not a single piece, but a composite of 492 hexagonal segments. Each segment is controlled by three activators and two edge sensors along each inter-segment gap to ensure accurate optical images. Eswar told the 102nd Indian Science Congress that India plays a pivotal role in setting up the telescope with a resolution 12 times better than that of the Hubble Space Telescope. "India will be involved in polishing the primary mirror and setting up its control system, besides developing electronics, edge sensors and actuators," Reddy said. The US will make the primary mirror segments, while China comes up with the tertiary mirror. Canada will put in place the dome and Japan the telescope structure. TMT will strengthen the perennial search for intelligent life elsewhere, as it provides direct imaging of planetary systems. It will also help astronomers study planetary atmospheres, their origin and development. While collaboration replaces competition as the mantra of astronomy and space science, India is a sought after partner. On top of the cosmic ventures, along with TMT, is the Square Kilometre Array (SKA), a next-generation radio telescope project in which India leads one of the nine packages. SKA will be 30 times more powerful than the best radio astronomy facility that exists today. Besides looking for extraterrestrial life, SKA hopes to help understand dark energy, sources of magnetic fields and the origin of stars and galaxies. "India is leading the work package involving the telescope's manager, which will effectively act as the telescope's brain or central nervous system," says Professor Yashwant Gupta, dean of the Giant Metrewave Radio Telescope (GMRT) located near Pune. GMRT has been designed and built by NCRA, a national centre of the Tata Institute of Fundamental Research. 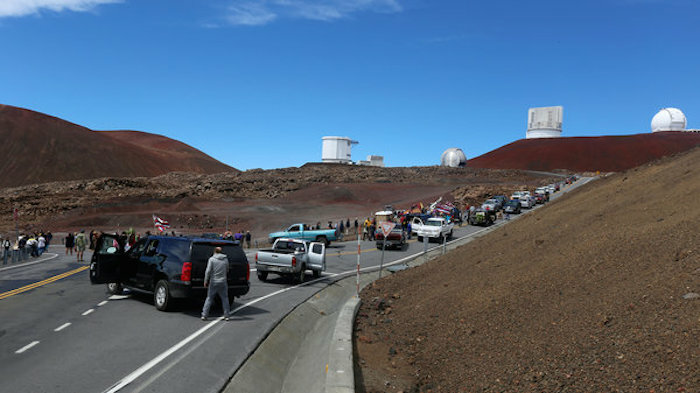 Protesters had been blocking the road to the summit of Mauna Kea to prevent construction from starting on the Thirty Meter Telescope. Gov. David Ige said Tuesday there will be a "timeout" for about a week on the construction on the $1.4 billion Thirty-Meter Telescope on the summit of Mauna Kea, which has been the scene of protests by Native Hawaiian activists and their supporters. At a news conference Tuesday, Ige said he has been in "meaningful discussions" with groups that have an interest in the telescope, including University of Hawaii and the Office of Hawaiian Affairs officials, who agreed to the temporary suspension of work. "We agreed there would be value to have some further dialogue on Mauna Kea," Ige said. "I do know it's a significant project and this will give us some time to engage in further conversations with the various stakeholders that have an interest in Mauna Kea." Last week, Hawaii County police arrested and cited 31 people for trespassing and blocking work vehicles from reaching the construction site. Protesters have been holding a vigil at the 9,000-foot level, objecting to the construction of what's being billed as the world's largest telescope. They say the mountain is sacred and that the 180-foot-tall project is too massive, threatening sacred shrines and burials and the island's water supply. The UH approved a sublease agreement for about nine acres leased from the state last year after the state Board of Land and Natural Resources approved the project in 2013. The BLNR approval came after a seven-year environmental review that featured more than 20 public hearings. Astronomers say the Thirty Meter Telescope will be the most advanced and powerful optical telescope on earth, capable of viewing galaxies at the edge of the observable universe, near the beginning of time. Although legal challenges are pending in court, the Land Board signed off on a notice to proceed with construction March 6, allowing construction equipment to be hauled to the site. More than 53,000 people have signed a petition opposing the planned observatory. 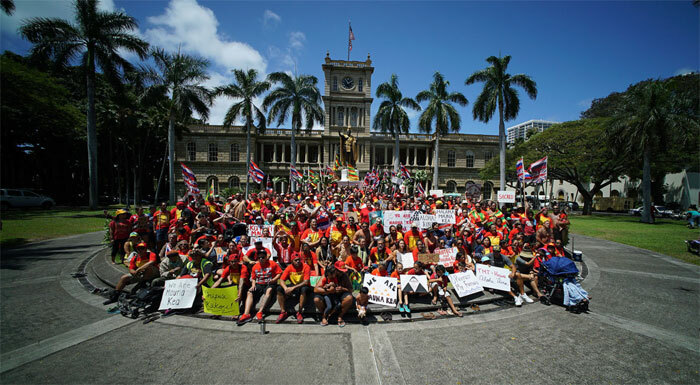 Hundreds of residents marched to the Hawaii State Capitol on Tuesday to urge the governor to stop the development of the Thirty Meter Telescope on Mauna Kea, a Big Island mountain that many Native Hawaiians consider sacred. Construction on the observatory stopped two weeks ago after 31 activists were arrested for blocking construction crews. Sometime in the 2020s, when an international consortium completes the Thirty Meter Telescope, the most powerful telescope on the planet, astronomers will gaze from the 14,000-foot summit of Mauna Kea volcano, on the Big Island of Hawaii, out to the edge of the observable universe. Or maybe they won’t. With a militant advocacy not often seen in the Aloha State, a small group of Native Hawaiians and their sympathizers have managed to stall the $1.4 billion project, which was to begin construction in April. They stood in front of trucks on the road to the summit and declared the telescope an abomination — to the Hawaiian people and their ancient religion, to the environment and to the mountain, revered in Hawaiian tradition as the piko, the navel, the island’s sacred center. Several were arrested last month. On Thursday the trustees of the Office of Hawaiian Affairs, a state agency charged with improving the well-being of Native Hawaiians, voted to rescind their 2009 vote of support for the telescope. Now they are officially noncommittal. The political eruption has left the telescope operators — the California Institute of Technology; the University of California; and research institutions in Canada, China, India and Japan — stranded. When they agreed this month to halt construction, Gov. David Ige thanked them for being “respectful and sensitive” to native beliefs and culture. It is not clear when the project will resume. The protesters don’t speak for all Hawaii residents, or even all Native Hawaiians, many of whom embrace the telescope. But it is easy to understand why they may feel fed up. Mauna Kea is a site of wonderment even before night falls and the stars come out by the billions. It is a habitat for threatened insects and birds, and rich in precious archaeological sites. It also has been stressed for decades. It’s hard to know if the anti-telescope furor has crested yet. The telescope builders have a strong claim to legitimacy, and they are being blamed for things they had nothing to do with — like the 1893 overthrow of the Hawaiian kingdom, the loss of native lands, the state’s many social ills and degraded environment. This is an unfair burden for a group that has spent years cultivating local support, navigating the approval process and successfully — so far — fending off lawsuits. It insists its paperwork is in order. It also points to plans to donate about $2 million a year to local causes like business incubation; job training; and scholarships in science, technology, engineering and math. Mr. Ige, who has been far too withdrawn in this confrontation, needs to step up. If he thinks the telescope is an important asset that promises great benefits to Hawaii’s residents and economy, not to mention to science and humanity at large, he should say so. If he thinks more needs to be done to protect the environment and native interests, he should say what that is and make it happen. His mild news releases urging more dialogue are not enough. Coexistence may never satisfy the core group of protesters who have been demanding the total erasure of technology from Mauna Kea’s peak. What is tragic is the missed opportunity for shared understanding, given that many of these protesters are themselves descendants of some of history’s greatest astronomers, Polynesian wayfinders who set out across the Pacific a millennium ago, guided by the stars and currents, to find Mauna Kea in the first place. A project to build a giant telescope near the summit of Mauna Kea has the right to move forward, but Hawaii has failed the mountain in many ways, Gov. David Ige said Tuesday. Amid protests and arrests of opponents blocking construction workers from accessing the site, construction has been halted since last month on the $1.4 billion Thirty Meter Telescope. Ige said it's up to the nonprofit telescope company to determine when construction will resume. "And we will support and enforce their right to do so," he said. Kealoha Pisciotta, a longtime Big Island critic of the Thirty Meter Telescope, said she's disappointed in Ige's comments, which she said lacked substance. "It created this illusion that we're going to do something without really doing much," she said, adding that his words will not prompt protesters to leave the mountain. "He affirmed that they will move forward," she said of telescope construction. "The deep sadness I feel is that means our people will be arrested." Telescope officials didn't say when construction will resume. "We appreciate that there are still people who are opposed to the project, and we will continue to respectfully listen and work with them to seek solutions," Henry Yang, chair of the TMT International Observatory Board, said in a statement. Ige also vowed that there will be major changes in stewardship of Mauna Kea, held sacred by Native Hawaiians. The University of Hawaii, which leases the land, must do a better job in its stewardship, he said, listing 10 actions he's asking the university to take. They include beginning to decommission as many as possible of the telescopes already on the mountain, with at least 25 percent of the 13 telescopes gone by the time Thirty Meter Telescope is ready for operation; legally commit that this is the last area on the mountain were a telescope will be considered; restart the environmental review process for the university's lease extension; and significantly limit noncultural access to the mountain. "We agree the university can and must do better and apologize for where our efforts have fallen short," university President David Lassner said, reading a prepared statement to media. The university will issue a more comprehensive statement this week describing what steps it plans to take in response to the governor's list, Lassner said. What's being requested is reasonable, he said. Ige also announced creating a Mauna Kea cultural council that will work with the state Department of Land and Natural Resources. He also wants telescope leaders to increase support for Native Hawaiian students studying science and technology. Governor David Ige says he wants at least three of those dismantled. It's not a new concept -- but rather, part of a state decommission plan that was drafted by the Office of Mauna Kea Management and went through a process of community review before it was approved by the Department of Land and Natural Resources in 2010. The University of Hawai'i leases land on Mauna Kea from DLNR for $1 a year and then sub-leases it to telescope operators for $1 a year. That lease is set to expire in 2033, at which time all telescopes on the mountain will need to be decommissioned. Each telescope operator is responsible for the cost of removal. 2016 and the land beneath it needs to be returned to its natural state by 2018. However, officials say sites may be re-used. "Anything that would place a current telescope on an existing site would have to be the exact same footprint and size. There are no new sites planned -- that was stated in the decommissioning plan and that was stated in our EIS -- no new sites after TMT, but there is the possibility that one of the current sites -- a new telescope could be built there. Though unlikely, that is a possibility at this point in time. It's a very fluid situation so we'll have to see what is determined," said UH spokesperson Dan Meisenzahl. Astronomers say each telescope has a different specialty and dismantling them will impact their mission, but it has always been a part of the long-term plan. "Decommissioning itself is a complicated process and we'll try to accelerate the timescale so that we fulfill our promise that only the best telescopes will occupy the spots on this precious mountain," said Guenther Hasinger, UH's Institute of Astronomy Director. a consolation prize for giving TMT the right to proceed with construction, but they say it's not. to our people, to the land -- it's harmful to the mountain itself. It's a desecration of a sacred place," said Dr. Jon Osorio, a UH Hawaiian Studies professor. Astronomers say the telescopes have unlocked secrets of our past and provide clues about where we're headed, but the power of current telescopes will be eclipsed by the clarity of TMT. "We are finding lots of extra solar planets -- planets around other stars -- and the holy grail there is to find a habitable planet or even a planet with life," said Hasinger. Hasinger says he understands opposition to the project, but believes the scientific and cultural communities can find a way to share the space. for this word sacredness, but I fully understand that the mountain is a very powerful entity and I think that astronomers have always respected that entity," said Hasinger. Those who oppose TMT say the telescope industry has had it's own way on the mountain, regardless of the impact on cultural and natural resources, for too long. place like Mauna Kea," said Osorio. Osorio says a failure by DLNR to properly monitor what UH was doing has contributed to Mauna Kea being treated not as conservation land, but rather as an industrial site. 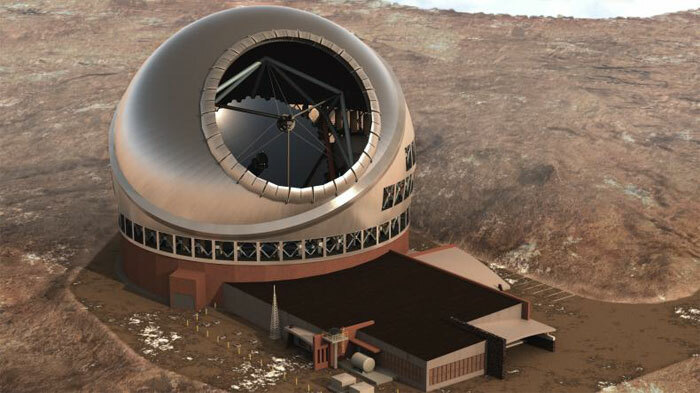 The planned $1.4 billion TMT Observatory for the summit of Mauna Kea on the Big Island. International partners of the Thirty Meter Telescope project atop Mauna Kea on Hawaii's Big Island announced Wednesday their intent to support Hawaii’s students as they pursue science and technology degrees. The California Institute of Technology and University of Chinese Academy of Sciences have pledged to create scholarships, summer internships, graduate program fellowships, and research assistant positions for Native Hawaiian and Hawaii students. Astronomy departments at the University of Tokyo in Japan, affiliated with the National Astronomical Observatory of Japan, are calling for graduate program applications from Hawaii students. In addition, NAOJ's Subaru Telescope will continue its collaboration with the University of Hawaii to offer jobs and internships through the UH Hilo astronomy graduate program. “As our plan evolves and develops over the next few weeks and months, we anticipate and foresee that within a few years a significant number of Native Hawaiians will not only gain educational experiences at prominent universities in our partner countries, but also return to Hawaii to carry on the Hawaiian tradition of scientific exploration, technological innovation and environmental sustainability, for the betterment of Hawaii and all of humanity on Earth,” TMT International Observatory Board Chair Henry Yang said in a statement. Construction stopped on the $1.4 billion TMT project in April following protests by some Native Hawaiian groups that contend that the observatory would desecrate sacred land. 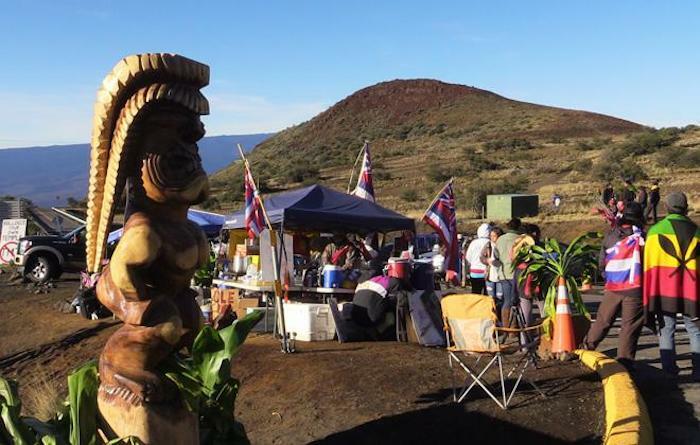 Protestors have camped out near the summit of Mauna Kea for two months. “After more than two months of consultation, education, and dialogue with many stakeholders, we humbly announce that the TMT International Observatory Board has decided to move ahead to restart the construction of the Thirty Meter Telescope on the morning of Wednesday, June 24. Our period of inactivity has made us a better organization in the long run. We are now comfortable that we can be better stewards and better neighbors during our temporary and limited use of this precious land, which will allow us to explore the heavens and broaden the boundaries of science in the interest of humanity. “We look forward to a positive relationship with all Hawaiians, while we understand that the majority of Hawaii’s people are supporting the TMT project. We deeply respect and are mindful of those who have concerns, and yet, we hope they will permit us to proceed with this important task while reserving their right to peaceful protest. “As done at any construction site, we plan to first investigate and assess any possible oil leakage and ensure we can provide proper maintenance of machines and equipment so they operate safely and correctly – in order to protect Maunakea and preserve the sensitive environment. We will then begin to repair and install fencing in the interest of public safety. “As we proceed, TMT is open and willing to allow cultural practitioners in the area of the construction site to continue customary and traditional practices. Allowing this practice to continue to occur will require further dialogue and mutual agreement to work out the details in order to establish a cooperative and harmonious environment for all parties. “In an effort to be sensitive to and observant of the Native Hawaiian host culture, we will deepen our knowledge of the cultural, ecological, and spiritual aspects of the mountain and continue to learn how to better respect and appreciate Maunakea’s important cultural areas. “This is a difficult day for Hawaii and TMT. As we attempted to begin our work today, we were met by protests that regrettably resulted in some arrests. Boulders blocked our access to the construction site and the Department of Land and Natural Resources deemed it unsafe for us to proceed. For the safety of our team, we made the decision to bring them off the mountain and we are planning to resume when the issue is resolved. “We want to thank the state and county police officers for protecting the safety of our team and the protesters and extend our gratitude to them, as well as to all of our supporters in Hawaii. HONOLULU — Eleven adults were arrested by the Hawai‘i Division of Conservation and Resources Enforcement (DOCARE) Wednesday, during a protest to stop construction of the Thirty Meter Telescope atop Mauna Kea. The arrests are unfortunate, but the state’s number one priority is the safety of the people on Mauna Kea – from TMT workers to protestors who are exercising their first amendment rights to peaceably assemble and protest in a civil manner. We are disappointed and concerned that large boulders were found in the roadway leading to the summit of Mauna Kea. This action is a serious and significant safety hazard and could put people at risk. Because of this, we are making an assessment to determine how to proceed. We will be working to clear the roadway tomorrow. Therefore, construction is on hold until further notice. **Governor David Ige is in Washington, D.C. for an energy forum with the Washington Post and meetings with Hawai‘i’s congressional delegation and federal officials. The financial impact from legal and other challenges to the Thirty-Meter Telescope at Mauna Kea and the Dan K. Inouye Solar Telescope at Haleakala is beginning to be felt on the University of Hawaii Manoa campus. The UH has already spent $2.2 million in attorney fees defending the construction of the telescopes. But now, the UH is being forced to cut funding for some of its overhead costs on the Manoa campus to pay for future legal bills, according to a UH memo obtained by Hawaii News Now. "We're taking it away from the kids and we should not be doing something like that," said state Rep. Isaac Choy, Chairman of the House Committee on Higher Education. "I would prefer the $2 million be spent on students' education, repairs and maintenance, fixing toilets, athletics ... the cancer center." "Paying lawyers instead of the academic mission of the university always hurts." The money comes from the Manoa campus' Research and Training Revolving Fund, which receives about $30 million a year from the UH system. From each federal grant, the UH system gets a 30 to 40 percent cut for overhead, then passes about half of that money back to the Manoa campus. That money is used to pay for everything from electricity bills to fixes on research equipment to travel for teachers. The money from that fund is not earmarked for academics. "None of this is research money," said Vassilis Syrmos, UH Vice President for Research and Innovation, who wrote the memo. Syrmos noted that last year, the UH spent nearly about a million to fix a research vessel for the Oceanography Department. "The year before we contributed almost a million dollars for our electricity spike," he added. But Cooney, a UH Public Health professor, said its unusual that such a large amount of the fund is being spent on a subject as controversial as the telescopes. "I think faculty are divided on that issue. There's certainly no consensus I can point to," he said. Choy blames the protests for running up the legal tab, especially since projects like the TMT have been properly vetted in public. "I feel that a vocal few is costing the university money," he said. "The process has been going on for seven years. We've dotted our i's, crossed out t's. How much more do you guys want?" Syrmos said that any poll of research faculty members who bring in significant amounts grant money will show widespread support. He noted that the telescopes are a major economic driver in the state, citing a recent study by UH economists that they created nearly $170 million in direct and economic benefits in 2012. "It is concerning within the university that the new normal is that in order to do any kind of research activity up on the mountain, it's costing the university millions of dollars," he said. "If the university is legally challenged we need to defend ourselves." The Hawaii Supreme Court has granted an emergency motion to halt construction on the Thirty Meter Telescope atop Mauna Kea. The respondents, Hawaii Board of Land and Natural Resources, Department of Land and Natural Resources and the University of Hawaii at Hilo, have until Nov. 24 to respond. Work previously scheduled for Wednesday was supposed to be restricted to site preparation, and included repairing equipment already on Mauna Kea and re-securing the site. “They said that it really was about prep work, repairing leaking vehicles and those kinds of activities that they would be doing on this segment of work at this time. Clearly, it’s not the start of construction,” said Gov. David Ige. According to Richard Wurdeman, the attorney who filed the emergency motion on behalf of plaintiffs, Tuesday’s ruling applies to all work, including maintenance, as authorized under the Conservation District Use Permit. Wurdeman says the group views the plan as a disregard of the legal process, as a final decision has yet to be made by the Supreme Court. There’s been no announcement on when actual construction of the telescope will start. The independent Ward Research conducted a statewide public opinion poll in October 2015. The total sample size was 613 residents, 18 years of age and older, conducted via both cell phone and landline. Support for TMT’s construction is split among Hawaiians/part Hawaiians, with 49 percent of those polled opposing the project and 44 percent supporting the project. 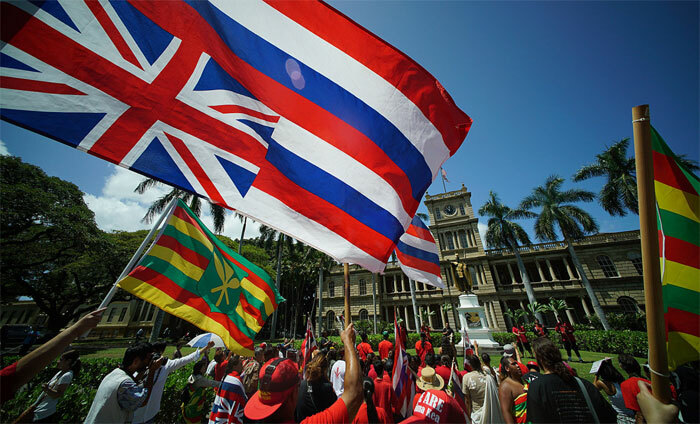 88 percent of Hawaii residents agree there should be a way for science and Hawaiian culture to co-exist on Mauna Kea. 75 percent of Hawaii residents agree that TMT has followed a lengthy approval process, including permitting, community meetings and environmental impact statements, so work should proceed. 74 percent of Hawaii residents agree that TMT will help create good paying jobs and economic benefits for those living on Hawaii Island. 63 percent of Hawaii residents agree that a failure to move forward with TMT after following all regulations would hurt Hawaii’s reputation as a place to do business. 62 percent of Hawaii residents support moving ahead with the construction of TMT. 59 percent of Big Island residents support moving ahead with the construction of TMT. The poll quota sampled for key demographic characteristics (e.g. age, ethnicity, gender, and island of residence). The demographics of the sample match the demographics of Hawaii based on Census data. The margin of error is plus or minus four percent. The Thirty Meter Telescope Project is a collaboration among Caltech, UC, the Association of Canadian Universities for Research in Astronomy, and the national institutes of Japan, China, and India with the goal to design, develop, construct, and operate a thirty-meter class telescope and observatory on Mauna Kea in cooperation with the University of Hawaii. Production on glass segments that will make up Thirty Meter Telescope’s primary mirror is underway in Japan. Over 100 of the 574 segmented mirror blanks needed for TMT’s 30-meter-wide primary mirror have already been produced in Japan, with 50 of those transported to a Canon factory in Utsunomiya for surface polishing. Coordinated research and development is underway with China, India and the United States to conduct additional polishing work. The mirror production process begins with unpolished glass segments produced at a factory near Tokyo. TMT has chosen a special glass ceramic material called ClearCerumTM, developed and produced by OHARA Inc. in Japan, to meet the telescope’s stringent specifications. These mirrors are made of high quality material with zero thermal expansion properties to prevent it from deforming. 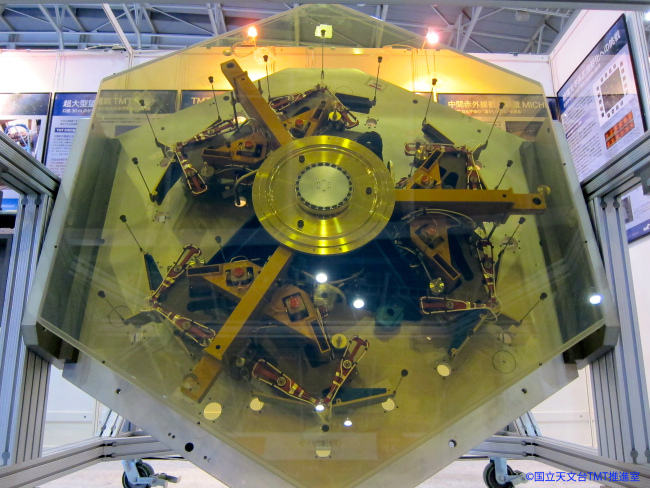 TMT’s primary mirror will consist of 492 hexagonal segmented mirrors, with an additional 82 spare segments. The Thirty Meter Telescope on Mauna Kea is expected to deliver sharper and deeper images than existing telescopes both on the ground and in space. This will allow scientists to find possible habitable planets around other stars and determine how earlier galaxies were formed.